Win-IN: People’s Vote campaign: Brexit is a big deal, not a done deal! People’s Vote campaign: Brexit is a big deal, not a done deal! Last weekend saw activists from nine pro-European organisations launch a grassroots campaign for a People’s Vote on the final Brexit deal. 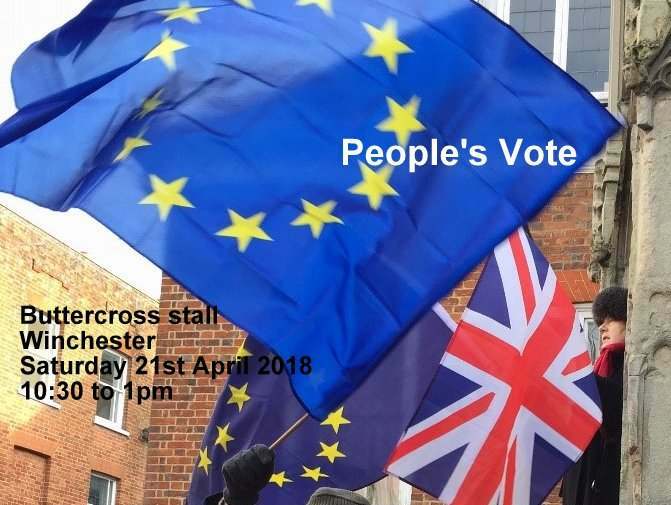 In support of this campaign, the Hampshire European Movement and other local organisations will hold a joint stall in Winchester on Saturday 21st April 2018, 10:30 to 1pm. A transparent ballot box will be available and the public encouraged to cast their vote for, or against holding the People’s Vote. Come and join us in Winchester High Street at the Buttercross, just to cast your vote, or stay and support us for an hour or two. Wear something blue, bring a flag, hope for blue skies. You can make the difference, together we can win. NB: please don't get confused, we have two different event notices out now - but they are both for the same event! You can sign up to this one or the other one, it doesn't matter as long as you come along! Links listed in no particular order. Interesting? Find more under Stories/Media! (c) Winchester International Network. Awesome Inc. theme. Powered by Blogger.